The global gynecological devices market is treading a growth path on the back of rising incidence of gynecological disorders such as fibroids and cervical cancer. Rising awareness among women in developing countries regarding therapeutics for gynecological disorders is stoking demand for gynecological devices. Global health organizations and non-profit organizations that conduct health awareness programs and health check-up camps periodically in these countries have been instrumental for imparting knowledge about women-centric health issues. Governments in these countries have also been involved to raise awareness about women health that impacts economic development. On the flip side, stringent regulations and long hauls for product approval especially in developed countries are challenging the growth of gynecological devices market. Owing to a multitude of positive factors, the global market for gynecological devices is likely to register a CAGR of 4.8% between 2017 and 2023. The global gynecological devices market is studied based on product type and geography. In terms of product type, surgical devices, hand instruments, diagnostic imaging systems, and gynecological chairs are the key segments into which the gynecological devices market is divided. Surgical devices, among them, accounts for the leading share in the overall market. Rising preference for minimally invasive gynecological procedures along with recent advances in conventional endoscopic surgeries bode well for surgical devices segment. The surgical devices market is projected to be worth US414, 956.8 mn by 2023. The surgical devices segment is further sub-segmented into endoscopy devices, fluid management systems, endometrial ablation devices, and female sterilization and contraceptive devices. Endoscopy devices hold prominence due to their capability to diagnose common female disorders and pathologies such as infertility problems and small vaginal hemorrhages. Technological advancements leading to design upgrades and miniaturization of endoscopy devices along with role of modern anesthetic medicine have been instrumental in growth of endoscopic procedures. Endometrial ablation devices hold significance due to their usability to treat all areas of endometrial cavity with minimal operation of the device. The segment was valued at US$510.5 mn in 2014; going forward the segment is predicted to display notable growth rate between 2017 and 2023. Fluid management sub-segment within surgical devices hold prominence as change in fluid volume that occurs during surgery and as a response to trauma needs to be maintained. However, high cost of fluid management systems limit their use especially in developing countries. Female sterilization and contraceptive devices within surgical devices holds notable share as they are most commonly used methods for family planning. The segment is anticipated to be worth US$7,802.9 mn by the end of 2023. Hand instruments segment holds significance due to their use in both examination and surgical settings. Vaginal speculum, tenaculum, curetttes, trocars, and biopsy forceps are the sub-segments into which hand instruments segment is divided. Diagnostic imaging systems segment in gynecological devices market is bifurcated into ultrasound devices and mammography devices. Ultrasound devices hold significance as it is the first-line imaging technique to detect pregnancy, miscarriage, and benign and malignant tumors. Gynecological chairs segment hold prominence for gynecology and urological examinations. The segment is anticipated to be valued at US$281.1 mn by 2023. Geography-wise, North America, Europe, Asia Pacific, Latin America, and Rest of the World are the key regions into which the global gynecological devices market is divided. North America held supremacy holding 41.1% share of the market in 2014; the region is anticipated to hold dominance in the years ahead too. 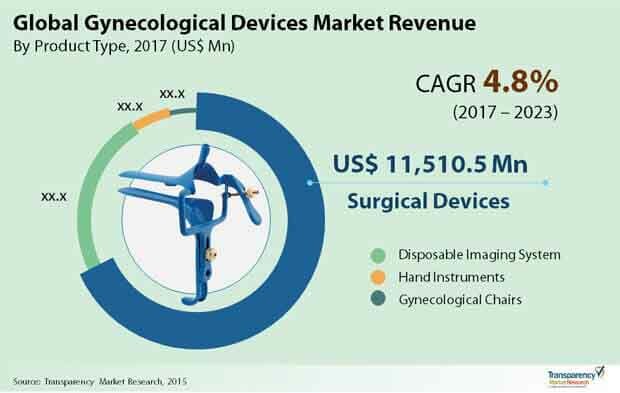 Prominent companies currently operating in the gynecological devices market include Boston Scientific Corporation, Cooper Surgical Inc., Hologic Inc., Ethicon Inc., Karl Storz GmbH & Co. KG, Richard Wolf GmbH, Medtronic plc, Olympus Corporation, and Stryker Corporation. The research study examines the global gynecological devices market in terms of revenue (in US$ mn) for the 2017-2023 forecast timeframe. For the research, 2016 has been considered as the base year, whereas 2015 revenue values are given for historical information. The global gynecological devices market has been broadly segmented depending upon product type and geography. Key product type segments include surgical devices, hand instruments, diagnostic imaging systems, and gynecological chairs. In terms of geography, the market is classified into North America, Asia Pacific, Europe, Latin America, and the Rest of the World. The report comprises an extensive executive summary that provides useful information about various segments and sub-segments. The report also analyzes key market dynamics such as demand drivers, restraints, and opportunities influencing the growth of gynecological devices market. The report provides an in-depth competitive analysis of the gynecological devices market based on Porter’s five forces model. The forces examined are bargaining power of buyers, bargaining power of suppliers, threat of new entrants, threat of substitutes, and degree of competition. Insights into winning strategies has been provided for new entrants as well as existing players to serve as a guide for strategic initiatives to establish a strong foothold in the market. The research study is specifically designed to examine the growth behavior of segments and sub-segments in the gynecological devices market. This is further used to provide market share and revenue estimations of these segments. In this report, combination of top-down and bottom-up approach has been employed to assess market size estimations. Furthermore, bottom-up approach has been employed to estimate overall market size. This is followed by percentage split to determine market size for key segments and sub-segments. Market size estimations and market attractiveness presented is validated through extensive primary research on the data collected in secondary research phase. Market size estimations involved comprehensive study of demand and product features of different gynecological devices. In addition, market related indications such as growing rate of gynecological diseases, increasing number of deaths due to these disorders, aging population, technological advancement in medical devices, and historical year-on-year growth have been considered to estimate market size. Primary and secondary research was carried out to understand growth trends, which were used to project the growth trajectory of the gynecological devices market in the near future. Secondary research sources include but were not limited to company annual reports and websites, investor presentations, SEC filings, press releases, data gathered from accredited bodies such as World Health Organization and Centers for Disease Control and Prevention.